con Arianna are two different works of identical proportions, on the same theme, that share a similar heritage. Since their execution, they have both hung together as a pair in a number of private collections and, because of the strange, enigmatic and timeless nature of Giorgio de Chirico's metaphysical art and his Piazza d'Italia series in particular, they have come to be considered related works. The Piazza d'Italia is the most frequent subject and repeated theme in de Chirico's oeuvre. 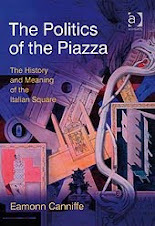 Deriving from a series of metaphysical paintings depicting a statue of Ariadne set amidst the dark shadowy arcades of a Turin piazza that the artist painted between 1912 and 1913, the Piazza d'Italia are meditative mandala-like variations on a theme that lies at the heart of the artist's complex aesthetic and lifelong journey of philosophical discovery. Numbering well over a hundred variants featuring Ariadne's sculpture alone, the Piazza d'Italia, with their melancholic evening shadows, 'ideal' architecture and strange angular perspective, exist in three distinct types: one with a fountain at its centre, one with the statue of Ariadne and one with a statue of a man in coat tails seen from the back - a monument to the 'political man'. According to de Chirico scholar Paolo Baldacci, their themes correspond to the subjects of the flux of time, feminine intuition and masculine creativity respectively. All rooted in the myth of Ariadne, the symbolism of all these variants, known under the title Piazza d'Italia was based on a synthesis of Greek mythology, Nietzschean philosophy and de Chirico's own life and experience. The story of Ariadne, a daughter of King Minos who is abandoned by the Athenean hero Theseus after helping him to escape from the Labyrinth where he killed the Minotaur, and who falls into the arms of Dionysus, before becoming immortalized in the stars, is one of enduring significance and meaning in the psychology-obsessed age of the modern era. De Chirico's Piazza d'Italia are founded on his own self-identification with this myth and his interpretation of it based largely on Nietzsche's radical re-reading of this timeless story. 'Who apart from myself knows what Ariadne is?' Nietzsche wrote in Ecce Homo. For him, the story of Ariadne is the story of the soul, abandoned by reason and logic in the form of the Greek hero Theseus and the ultimate welcoming of the 'super-hero' in the form of Dionysus, god of the mysteries of the earth and body. 'I am your Labyrinth' the god Dionysus whispers into Ariadne's ear, appearing to her in all his magnificence as a synthesis of suffering and happiness. Dionysus and Ariadne's relationship is therefore a symbol of the body's relationship to soul and ultimately of Ariadne's acceptance of and willing return the labyrinthine mystery of life. As Paolo Baldacci has explained, 'The Ariadne of Nietzsche and de Chirico is the Ariadne abandoned by Theseus, awaiting the arrival of Dionysus. She is the soul prepared to face the Labyrinth, exemplary symbol, philosophically speaking, of the rejection of the traditional notions of knowledge. The desire to know and understand the world, as defined by Cartesian logic, grows out of a need for security which Nietzsche labels as cowardice. Security demands stability and order, and excludes all that is variable and confusing. As such, the desire for knowledge holds as its goal the defeat of Chaos and of Time, represented by the Labyrinth and the Minotaur. But, Nietzsche asks himself, are there any true realities beyond Chaos and Time, or are they mere fictions, born of the fear of seeing the world as it really is -which is to say contradictory and unstable?..In our need for security and our lack of courage, most of us avoid the Labyrinth, while Nietzsche urges following Ariadne's thread back to its heart, back to the corporeal soul and its silent discourse, even if such a voyage risks ending in a shipwreck of the mind. De Chirico restricts his use of the Ariadne theme to the Turinese iconography because he wishes to make clear its link with Nietzsche's voyage of the soul, which ran aground in Turin' (Paolo Baldacci, Giorgio de Chirico The Metaphysical Paintings, London 1997, p. 138). Turin, the city which had revealed to de Chirico the 'strange and profound poetry' of 'an autumn afternoon' and awoke in him the philosophical belief in another reality underlying that of perceptual understanding, was also the location where Nietzsche had gone mad, breaking down one afternoon after witnessing a donkey being abused by its owner. The end of Nietzsche's metaphysical journey, forms the starting point of de Chirico's own voyage. The architecture of Turin and the strict rational logic of one-point perspective, championed by the humanistic philosophy of the Italian Renaissance, became subverted under de Chirico's brush into a metaphor for the chaos of the uncanny. Built by Daedelus, the mythical Labyrinth, was, according to Ovid, a place in which the eye was tricked into error by a wealth of misleading points of visual reference and it was in this spirit that de Chirico designed his own eerie, and fallacious multipoint perspectives. De Chirico addressed the misleading illusionism of reason and logic, as embodied by perspective, in many of his works, not least in the Piazza d'Italia, which, in their architecture, often recall and subvert Renaissance images of the so-called 'Ideal Cities' of Fillipo Brunelleschi or Piero della Francesca. Time, too, is often suspended or even subverted in these works, which often bear deliberately incorrect dates inscribed by the artist. 'The man of philosophic turn', Friedrich Nietzsche, wrote in his Birth of Tragedy, 'has a foreboding that underneath this reality in which we live and have our being, another and altogether different reality lies concealed, and that it therefore, is also an appearance'. (Friedrich Nietzsche The Complete Works of Friedrich Nietzsche, O. Levy (ed. ), New York 1911, p. 23). In these poetic but stage-set like paintings, all is artifice, time has come to a stop. Only the pervasive feeling of melancholy, implied by the contemplative statues of Ariadne reclining, or the politician standing like a mysterious phallic and patriarchal presence alone at the centre of a bizarre and ultimately illusory world, imbues these paintings with any emotion or Dionysian sense of life. For de Chirico in the late 1930s particularly, the isolation of these figures also echoes de Chirico's own cultural isolation. Finding himself removed from the majority of modern artists and their ideology, and vilified and ostracized by his first champions the Surrealists, de Chirico was very much alone in his pursuit of a deeply personal artistic odyssey that remained obscure and unintelligible to most. 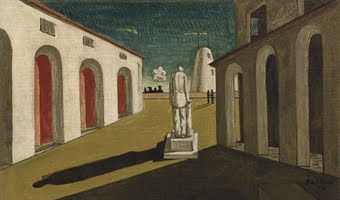 Combining themes of chaos and time, of harmony and eternity and of the essentially hermaphroditic nature of artistic creation - a creation dependent on the tense conjunction of masculine and feminine elements - de Chirico's Piazza' d'Italia are like the images they show, repetitive monuments to the metaphysical journey of the artist through life. Depicting more or less the same scene, for each painting is always consciously a slight variant of the others, this is a journey beyond time, but rooted in the timeless and eternal myth of Ariadne and her thread.